Flawless Power of 999 Week 3 is Mesoestatic Peel. The regular price of this service is P1,500/session. Giving you a savings of P501/session. This offer is good from October 22-28, 2010 only. 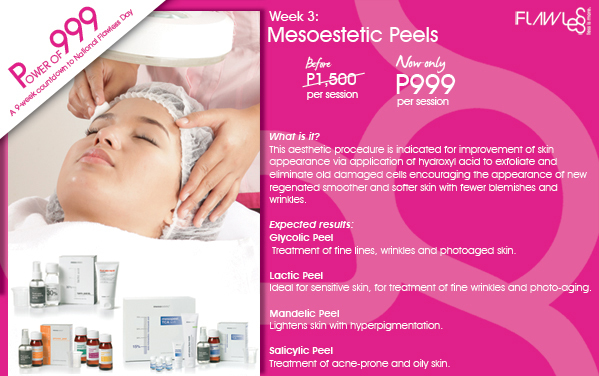 Mesoestetic Peels are apt for all skin types as a regeneration process to improve its condition. Its skin exfoliation and regeneration action together with the characteristic properties of each acid, make them extremely useful for people with skin blemishes, acneic tendency, flaccidity, small fine lines and wrinkles, stretchmarks, acne scars, and generally any skin imperfection. Use of the Mesoestetic Peels encourages exfoliation of different surface layers of the skin, favouring cell regeneration, facilitating restoration of collagen and elastin fibres. After a peel application the skin appears younger, hydrated and luminous with greater tonicity and turgency likewise a reduction in minor and deep wrinkles. Better structured skin, due to greater cell reproduction activity with synthesis of new numerous collagen and elastin fibres. Smoother softer skin due to exfoliation of the outer layer of the skin. More luminous and uniformed skin tone reduces skin blemishes and imperfections thanks to regularisation of the melanocyte population which controls skin hyperpigmentation.